Should You Buy Janome Magnolia 7318 Sewing Machine? 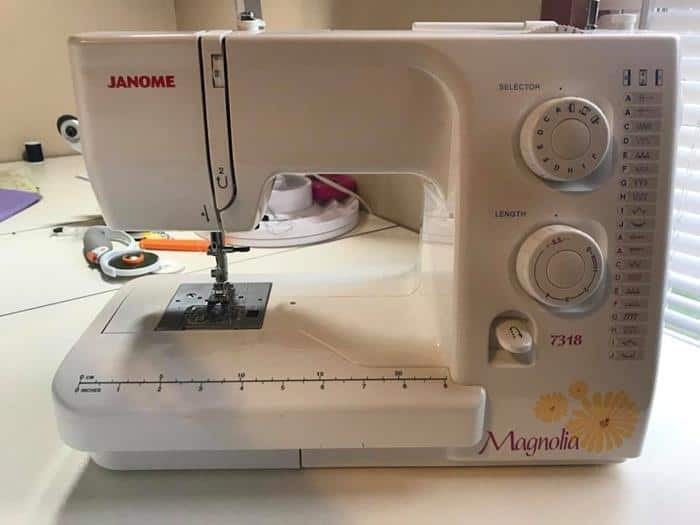 If you’ve been looking for a quality beginner’s sewing machine, you’ve likely come across the Janome Magnolia 7318 sewing machine. This versatile machine is one of the several popular lines by Janome, who is one of the leading manufacturers of sewing machine products globally. But does this machine hold up to scrutiny? Is it good enough to justify the positive reviews you may have read online? To sum up, yes it is. In a Rush? Click here to buy the Janome Magnolia 7318 from Amazon. With our Janome Magnolia 7318 review, we will take an in-depth look at this machine. We’ll look at everything it has to offer and help you evaluate if this is the right machine for you. Choosing the right sewing machine is important because it is likely to last you many, many years. We can help you decide if this is the sewing machine to fit your needs and give you all the information you need to make an informed decision. Who is the Janome 7318 best for? What are the features of the Janome 7318 sewing machine? What are the different stitches that this machine can sew? What feet come with this model? What kind of warranty does Janome offer? Janome (pronounced Ja - NO - mee) is not exactly a household name. But if you are familiar with the world of sewing, you’ve likely heard of the Janome Sewing Machine Company, Ltd. Founded in 1921 in Tokyo, Japan. It is one of the world’s largest manufacturers of sewing machinery. In Japanese, the word “Janome” means “snake’s eye” and was used because of the resemblance of the company’s first innovative bobbin design that reminded some people of a snake’s eye. Today, it is an international company with subsidiaries all over the world. They manufacture a vast array of sewing machines, embroidery machines, and sergers. They were the first company to offer an in-home computerized sewing machine in 1979 and have pioneered other such innovations in the sewing industry. They also produce many “white label” machines that other companies sell under their name. So, there is a chance that if you’ve owned a sewing machine before, you may have already owned a Janome! Check today's price of this machine on Amazon. This model is often marketed as a “beginner” machine. It comes with basic stitches, feet, and functionality so someone looking for an advanced machine that can do more complex sewing might not be satisfied with the limited options. Janome currently makes lots of different models of sewing machines and there are certainly some simpler and some more complex than this model. You might consider this model closer to an intermediate machine than a beginner machine. If you are someone who is learning sewing for the first time and will be trying to figure it all out by yourself, simpler models do more for you (like ones that have an automatic needle threader). However, if you have someone who can walk you through the machine and teach you how to use it, this would be a great first sewing machine. With adjustable needle positions, customizable stitch lengths, drop feed dogs, and an extra high presser foot option, intermediate seamstresses will find this machine handy for garment constructing, mending, home decor and different sort of arts and crafts projects. At 17.6 pounds and with a handle feature on the upper arm, this machine is portable for those looking for a quality machine to take with them to sewing classes. Check today's price on Amazon. This sewing machine provides approximately 6.2 inches needle to base workspace and neck is 4.5 inches high. You'll find it hard to do free motion quilts with a small opening like this. While there are wider opening available on other expensive models, this should be enough space for most small projects. The user-facing side of the work area also features a measuring ruler in both inches and centimeters. This can be handy for quick measurements and to keep you from having to search for your tape measure all the time. Beneath the work area is a storage compartment where you can conveniently store all your accessories. This keeps them right at hand and helps you avoid losing your spare needles, bobbins, thread, etc. You don't have to remove your project from the work area to access the storage, as it slides below the surface area. And the entire work area can be removed to give you access to the free arm. By removing the excess work area, you will be able to sew circular projects like hems and cuffs. While it would be possible to make these seams without the free arm, it makes it so much easier to manipulate and move fabric around. Removing the free arm can also be useful when working with big, bulky fabrics which tend to bunch up. 7-piece feed dogs to guide the fabric through the machine and allow for even stitches without you have to push the fabric. The feed dogs will grip the fabric and slide under the needle at an even pace to keep your stitches uniform. If you are working on finer projects which require more control over the spacing of the stitches or if you are sewing buttons, you can drop the feed dogs. This allows you ultimate control over the stitching. The drop feed lever is positioned on the back of the machine just below the needle. You will be able to feel for the lever and drop or raise the feed dogs with ease. Whenever you finish sewing a stitch, the manufacturer has equipped the left side of the upper arm with a useful thread cutter. Just pass the thread over the cutter, and your stitch will be separated from the thread wound through the machine. This removes the necessity of having to find your scissors every time you finish a stitch. It also has a convenient reverse lever on the front of the machine. This will allow you to do backstitching at the end of a run to secure the stitch. This is a necessity when sewing garments to ensure that the stitches remain secured throughout the life of the clothing, or when sewing heavy-duty projects that might need some extra support. Check the latest price of the Janome 7318 at Amazon here. When it comes to the bobbin, Janome has equipped this model with an easy to use top loading bobbin with a transparent cover. To load the bobbin, you simply need to drop it into place, thread it through the metal hook, and close the lid. The machine will do the rest. And with the transparent cover, you will never have to wonder when the bobbin is about to run out. An easy to use bobbin winder so that you can load multiple bobbins, and have them ready to switch when changing threads. It also features an additional spool pin, so that you do not have to unthread the machine just to wind a new bobbin. This saves you the hassle of having to unthread and rethread the machine just because you want to load a bobbin. Another nice feature offered on this model that is not always featured on “beginner” sewing machines is the ability to move the needle to widen or narrow the stitch width. This gives you excellent control over where you stitch lands on the fabric. By changing the needle position, you can create some beautiful stitches without having to move the fabric. You can keep the fabric on the same guide throughout the stitching process. A simple dial to adjust the thread tension on this machine. This helps you keep the right amount of tension as you work with different threads and different fabrics that have various effects on proper thread tension. Beneath the upper arm, this sewing machine also has a light to illuminate the workspace. This can brighten the area where you are working when it matters most. This sewing machine comes with a nice selection of both utility stitches and decorative stitches. To give you an idea of just a few of the stitches you will be able to do with this machine. We will look at just some of the popular stitches. The straight stitch option will be used most often, but with the stitch length dial, you can customize just how long you want these stitches. This gives you an excellent advantage over other beginner models which have only fixed widths. And to pair with the blind hem foot is the blind hem stitch which will hide the stitch for you and give you a clean finish to the fabric. Both these stitches are essential for the seamstress to master, and the Magnolia will help you do just that. It also comes with a zigzag stitch that can be set at different widths for different fabrics. These tight zigzag stitches are great for sewing in satin and other delicate fabrics or fabrics that require some stretching. You can do overcasting with this stitch. When you need to keep edges from unraveling or just to complete a hem; like I did in this d﻿﻿enim guide. To finish stretching fabrics and to seam them, this machine comes with a knit stitch that does not stitch too tightly and has just enough give to match the fabric. If you need to finish an edge on synthetics and fabrics that pucker, this model comes with a tricot stitch. 5/8 inch allowance is recommended for this stitch to execute properly on your fabric. To join two pieces of fabric together, but leave an open appearance, this comes with a fagoting stitch to make this nice and easy. This can be quite useful in multiple projects and even when doing your designer garments. When it comes to decorative stitches, Janome gives you several elegant options like the pin tucking, feather stitch, the scallop satin stitch, the honeycomb stitch, and a few others. If you have decorative pillows, curtain, or just want elegant stitching in your garments, this machine offers some great stitches. You should be able to find one to fit your project. Because this is a “beginner’s model,” Janome provides only essential feet that are required for regular sewing projects. Like most modern models, the feet snap on and off the machine without any need for tools. This makes it simple and quick to switch out the presser foot for whatever project you are working on. It comes with a special four-step buttonhole foot to make sewing buttonholes easy. This can be a complex process, but with the turn of the dial to buttonhole stitch and by attaching the buttonhole foot, you can adjust the exact length you want to sew in the buttonhole without much difficulty. You will be able to sew the buttons themselves easily into the opposite side of the garment or another project. And with the seam adjuster, you can stitch a wide variety of button sizes with just the turn of the dial. Further, with the high-level presser foot, you can sew large buttons into relatively thick fabric without having to try and jam the fabric and the button under the presser foot. All of these features make sewing buttons and buttonholes possible for even the beginner sewer. This model also comes with a blind hem foot for sewing those hidden seams around pant legs, sleeves, or other projects. This can be a tricky stitch to sew, but with the blind hem stitch and some practice, you will be able to hide your stitches. Janome also includes a zipper foot so that you can attach a zipper to most of the fabric reasonably easily. With all these footer attachment, it comes with everything you would need for sewing most garments like pants, shirts, sweatshirts, dresses, etc. It has a fairly limited work area under the arm. Some models come with twice the length of the working area which is good for bigger and bulking material. You might find you have some trouble with these kinds of materials if you need to sew too far from the edge of the fabric due to the limited work area. You'll not find automatic needle threader, walking foot and hardcover with this model. However, you can always purchase walking foot and cover. Also, the ruler on the cover only measures at half-inch or 1-centimeter increments. That’s not all that helpful. It seems Janome could easily have included smaller increments to make the ruler more useful. Most people will prefer to keep their own tape measures at hand. Janome offers a fairly generous warranty on this model. They offer 1 year on the motor, foot pedal, and belts and 2 years on certain other component parts (see the specific warranty for exact details). Within these time frames, Janome will warranty the sewing machine against manufacturer errors or parts defects. This does not include normal wear and tear type problems like the needle breaking or the light bulb going out. They will replace or repair your machine at their discretion from a qualified dealership. They also offer a 15-year warranty frame and certain other component parts of the machine. While this is a nice offer, it is unlikely ever to come into effect. Unless you drop the machine, there is no reason the frame should ever break, and if you do drop it, Janome will not warranty it anyway. All in all, 1-2 years (depending on the component) for parts and labor on the machine should give you some peace of mind that your sewing will be covered should something happen to your machine. After doing this Janome 7318 review, we can safely say that this is a good machine for the beginners to get started. With its versatility and multiple functionalities, you should be able to find a way to use it on many projects. It comes will all the basic accessories you will need to get started sewing, and Janome offers a wide range of sewing parts to increase the functions of this machine. If you want a good machine that is going to take you from beginner to intermediate, this machine is a great option. Click here to buy the Magnolia 7318 at Amazon here.